Some of us find it delightful to have a near perfect lawn which should look beautiful at all times. Having an essential tool like an edger can come in very helpful and help you achieve that lawn you have always wanted. It can get all the soil and grass out of the tightest spaces where even trimmer could not get. A lot of people have tried to use other gardening tools to make their yard or lawn look beautiful but couldn’t achieve that; only an edger can give you that by creating a beautiful edge for that finishing and wonderful look for your lawn. 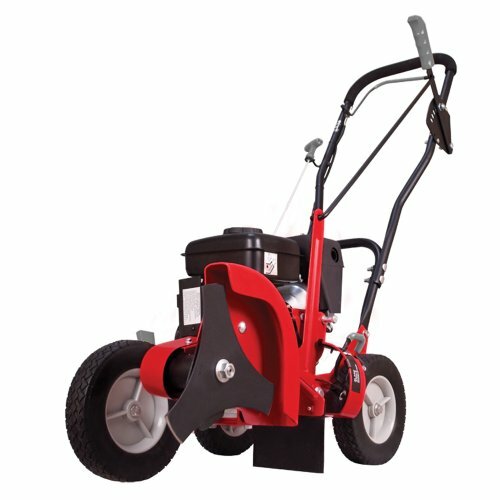 In case you don’t know what an edger is, an edger is an engine powered machine with a vertical spinning blade that is used majorly for trimming yards, lawns and pathways. Any lawn that is looking well-kept and nicely trimmed, an edger must have been put to use there. Getting the best edger for your lawn isn’t an easy task especially if you want to get the best value for your money. You will find a lot of products on the market with different features and similar looks. The truth is they might not function the same way and that is why we have taken time to do thorough research and bring to you our list of the top ten best edgers you can find in the market. The Worx WG175 Edger/Trimmer is a powerful 3 in 1 unit with premium quality. Not only does it feature a hedger and trimmer, but it also has a wheel component to equip the trimmer and makes it capable of taking on lawn mowing tasks with ease. 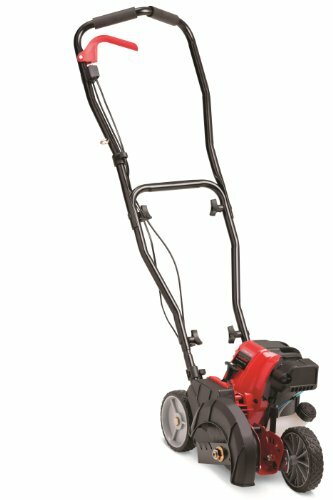 It comes with a thirty-two-volt battery pack that make sure the edger is powerful enough to handle the tough parts of the lawn, and the adjustable shaft gives comfort when held as it easily fits all sizes of people. Not forgetting that it is lightweight and easy to handle as you trim down your yard or lawn. However, the string of the edger can be a little fragile, making it prone to winding up which will cost you when replacing, but this edger is easy to like edger that will do well and suit your need of an edger. If you are also looking for a substitution for a full blown lawn mower, then this is not the edger for you, it works great as a way to touch up your yard. One great feature about the Black & Decker LST420 is the battery life. It has an excellent battery life that can run for about an hour. It is a lightweight model with a 5.7-pound design model that won’t get you all stressed up as you work. Though compared to some other products, it isn’t more powerful but it can do well with grasses that are not too thick and stubborn. It has a PowerDrive transmission that helps to deliver more power from the motor to the cutting string to get the job done fast, and a runtime extension technology with dual mode accelerator switch to give you maximum performance. The automatic feed spool ensures continuous work without bumping unless when it gets to 45 minutes of use where the performance will start to dwindle and limiting what you can achieve for the last 15 minutes of battery time. It includes (2) 2.0-Amp-hour lithium battery packs- each battery pack delivers 33% more capacity than the LBXR20 battery pack. It is quite affordable and a great choice of an edger if you are working on a budget. This edger is highly durable with all the necessary features of an edger, with a standout feature of a curb-hopping capability. It has three wheels; two in the back and one in front. They both adjust so they are on the level needed for the edger to ride the curb to cut a straight edge. This is a combo model that acts as a wheeled string trimmer and edger. The 8inches straight blade can be adjusted to help create a clean edge for your lawn, driveway, landscaping and sidewalks. The 4.75inches dual wheels give you an easy rolling and a precise edging while the centrifugal clutch halts the edger when it is idle. It is an add-on edger that is easy to maintain and store as it can save you some space and is quite affordable. The replaceable steel wear plate protects the bottom from damage during use. For a final touch for your yard, this edger is the perfect accessory for that. If you are looking for a way to save some cash and still invest in a good edger, then the GreenWorks 27032 Edger is one to consider. It is a lightweight electric edger that is ideal for a small yard or lawn. It has a 7.5″ double-edged blade that provides a robust edging capability. Its front wheel has a spring assist that provides a variable blade depth. For added comfort and control, its auxiliary handle is adjustable. There won’t be an accidental disconnect since it has an integrated cord lock feature. With a 12-amp engine, it is powerful enough to take on edging tasks. This GreenWorks model doesn’t have a grass to root removing power compared to other products on our list since it has a short blade of 7.5 inches which is okay for occasional use. It features a push-button ignition instead of a recoil cord, making it a great edger since it will start on the first try. You will be needing an electrical outlet for it since it is electrical. With the Black & Decker LCC221 Edger, there won’t be a need for stooping and bumping. It is a 20-Volt MAX* Lithium 10-inches edger that enables you to trim, edge, and sweep for a neatly groomed and beautiful look. It is lightweight and might be flimsy but it’s a great one to work with. It is lightweight, quiet and trims any overgrowth, edges borders and clears all debris with ease. It is ideal for making edges on driveways, sidewalks, decks, and garages. It has an Automatic Feed Spool (AFS) that automatically feeds trimmer line when needed with no bumping required. It can be easily converted from a trimmer to a wheeled edger or the other way round. With its adjustable height and handle, you will be comfortable while working with it. The 20V MAX* Lithium Ion 1.5Ah battery holds a charge for up and powers up your style for up to 18 months as you clear debris from sidewalks and deck with ease. When it comes to having raw power, the Troy-Bilt TB516 EC sets a mark with a four-cylinder design, unlike other models that come in two-cycle engines. This power excludes the need to mix oil and gasoline for fuel, and also generates more than enough turning power for its 9-inch double-edge blade. Although you will have to have a backup fuel just in case since its gas tank capacity can only hold 0.4 quarts, but a great feature is its battery-powered JumpStart engine starter which allows easy starting. The starter can be attached to the side of the machine. The engine starter style is much better than pulling the recoil cord even if it is less convenient than a push-button ignition. It is lightweight with just 22 pounds which is surprising due to the power it wields. The three-wheel design eases its controllability and maneuverability even when on uneven terrain. It also works well on cold weather unlike others that cannot, but once it is under 40 degrees Fahrenheit, you should warm up the engine before using it. This is one perfect pick for a large yard. If you are looking for a very light edger that wouldn’t put much strain on your body and puts you in control as it is easy to handle and maneuver, then the Black & Decker LE750 is one to consider. Weighing 12.4 pounds, the edger is so light to ease your stress. It is also of a compact size to help you save space and make it quite easy to get into tight spaces and cut around curves. 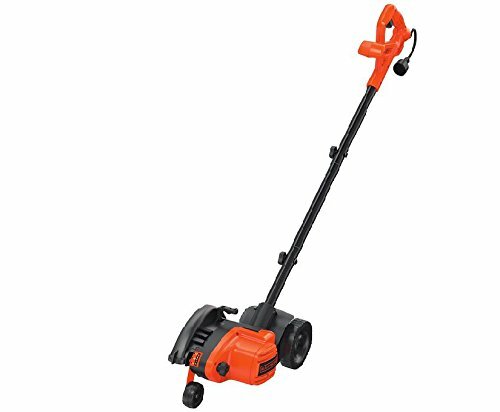 It has a hardened steel sturdy blade of 7.5-inch and an 11-amp motor that isn’t too bad for an electric edger since it gives enough cutting power to cut through grass and roots. The handle can be easily adjusted to suit both a right-handed and a left-handed person with a trigger that makes the edger easy to start and stop. The auxiliary handle helps to guide the machine when handled, and with the two rear wheels, a front guide wheel, it also becomes very easy to handle and you give your grass a straight cut. It can boast of a 12-Amp high-torque motor that can take on a tough overgrowth and create a nice and clean-looking trench. 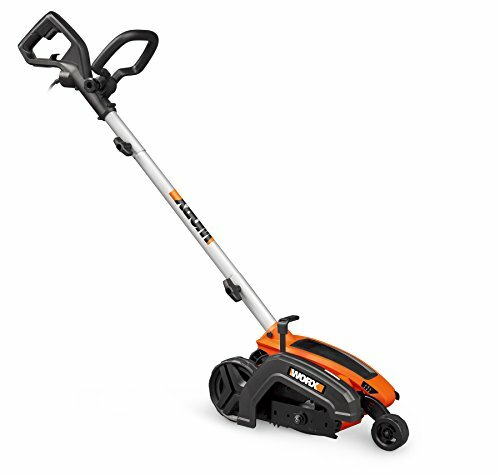 For the small to medium sized yard, the WORX WG896 is a good edger that draws its power from an electrical outlet. Although, you will get limited by the length of your extension cord but on the good side, it has an electric cord lock that will keep it from disconnecting (this can be a major problem for some corded yard tool). It features two wheels at the back and a guide wheel in front of it to enable stability and a guide in a straight line. The 3-position blade depth adjustment, shaft length is adjustable, so it is comfortable enough to use for any length by adjusting to your length. The secondary handle of the WORX WG896 pivots, making it easy to place in a comfortable position. It is a lightweight edger that is designed to maneuver around any corners when in tight spots. The cutting line indicator helps for additional precision. Compared to other products, it has a powerful 12-amp motor that provides premium performance. With the Ryobi P2300A Edger, maintaining a flawless landscaped yard comes in a breeze without using a landscaper. It is a perfect lightweight tool that is specially designed to create lines around driveways, flowerbeds, walkways, yard, and patios. This Ryobi product is heavily designed with a 4-position depth adjustment, enabling it to fit all your edger needs and with a dual serrated 9-inch blade for durability and longer life. It has a front and rear wheel for added stability and the over-mold handle assures your comfort throughout the process of giving your lawn that beautiful edges. By simply popping the battery in, your task can start! A lithium-ion battery comes with it to ensure you get fade-free power from start to finish, and a great feature about this battery is that it can be used on any of the tools with same product- just like a universal battery. Its lightweight design is for user’s maximum comfort and convenience when it is handled. The sharp blades make cutting grass an easy process. The EGO Power+ 56-Volt Lithium-ion Cordless Edger is a good choice for creating clean and precise edges around your sidewalks, driveway, and patio with a breeze. It has a multi-head that is compatible with all of EGO multi-head attachments. It is highly equipped with a variable speed trigger, a lock-off switch and a guide wheel with a deep adjustment knob to suit your body type. It is a water-resistant construction that makes it highly durable and difficult to corrode. Its genuine EGO parts ensure capability, quality and performance with a 5-year limited warranty to back it up. This edger features a manual recoil, an easy to start, curb hopping ability, five depth positions, a triangular three-point blade which allows cutting of up to 2.5 inches, and a blade that can be adjusted for a bevel cutting. 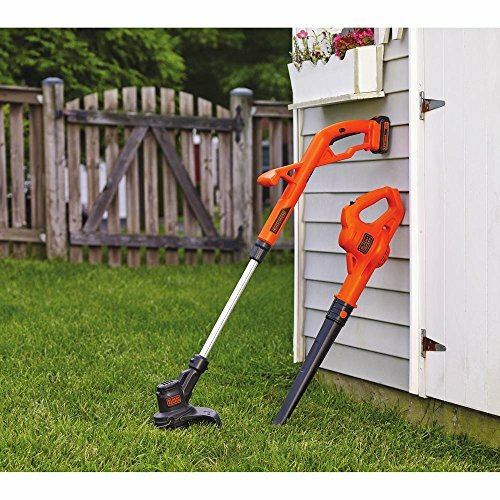 The frame and blade guard is strongly built solidly strong to take on yard duties without hassle. It easy to assemble, quiet, and get deep into the difficult parts of your yard with the aim of making it beautiful. It starts with one pull. In order to make the right investment in an edger, there are some steps to take. There are a lot of products in the market and it will be confusing to know the one that will offer the best of what you need. the below-buying guide explains some buying considerations and hopefully, it will make your decision easier. You might be wondering why you need an edger since it cost money and you might just get a plain old weed eater to just do the job instead of an edger. Well, there are plain old weed eaters that are less expensive. But it will be more beneficial when you buy a combo set instead of two tools later on. One of the most important things to consider when buying an edger is the power. It is what will give you the result you hoped for, so always look for an edger with more power. The more power an edger has, the less time you will be spending getting your yard or lawn all trimmed up. If you want to know the power capacity, take a look at the specifications of a motor, when the number of rotations the motor is able to generate per minute is higher, then the more likely it will be strong enough to take care of tough grasses or weeds. In order to not get tired easily, you should be looking out for a lightweight edger that is easy to carry around as you work. Basically, a light weight edger will also be featuring less power but a 6 or 7-pound edger should be more than enough to take on your lawn without leaving you all stressed up after the days’ work. There are three major power sources for powering up your edger, they are; battery, corded, and gas. All these options of power have its good and bad sides. For instance, the corded actually maintains a constant power but not quite mobile while the battery powered is an easy one to move around but needs a regular charge, and the gas option is a very powerful one but the price is always on the high side and it tends to be noisy. It will be best to go with one that will fit the property that will be using the edger. When you are going with the battery powered option, it will be best to put the battery life into consideration. This will determine how fast you can finish up and whether it won’t stop half way through your work when it needs a recharge. Normally, it should take about 30 minutes to treat an average sized yard, but it will be wise to go for an edger that can stand a little more than that without needing a recharge, just in case you will be needing more time. The best battery packs should be able to give about 45 to 60 minutes of battery life. You can decide if you will be needing an edger that you can walk behind just like a lawn mower or if you want a model like a weed eater. If your edger is what you will use seldom, then a stick model is okay for you. But you should note that the walk behind models covers more area and are more precise, so it is a good choice if you need something with more power. Edgers come in different shapes and sizes, making them also different in weight. The size of the engine can affect the weight greatly by making it heavier. A heavier model can be difficult to push around and may get you tired easily, not also forgetting it is hard to maneuver. But the heavier model is always more powerful, highly durable, with more features when compared with the lightweight models. When you’ve decided whether it is a gas-powered, electric or battery-powered edger you are going for, you should make sure to know how far away you will be using it. An electric edger will be needing an extension cord for power and it will be stress-free if you have a long extension cord or if where you will be using it is close enough to the house. A gas powered or battery powered model will be a suitable choice if where you plan to use the edger is far away from where it can be plugged into electricity. The battery-powered are always convenient and comfortable to move around but the battery life is limited and it takes time to get recharged. The downside of the gas-powered is that you have to mix oil and gas oil by yourself to get it powered, but it is best to take on tough tasks. In conclusion, we have finally come to the end. We hope this guide will make your shopping easier with all these options to consider before making a decision.